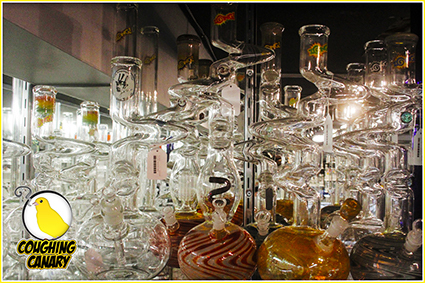 Located in Old Town Scottsdale, Coughing Canary is Arizona’s largest smoke shop, featuring hundreds of different products for sale, from some of the best name brands in the industry. From custom, quality glass and water pipes, to hookah tobacco, e-cigarettes, e-liquids, vaporizers and other smoking accessories, we’re your premier authority on all smoke and counter-culture products! The Largest Smoke Shop in Scottsdale, AZ! For the largest inventory of smoking apparatuses, tobacco, vaping supplies and other smoking products and counter culture items, look no further than Coughing Canary! As the most expansive smoke shop in Scottsdale, AZ, we take pride in offering you quite literally anything you need to have the optimal smoking experience. From your favorite brand of loose-leaf tobacco, to a brand new water pipe, to papers and blunts, our shelves are filled with an infinite expanse of products designed to meet your needs and pique your interest! We’ve even got one of the fastest growing and most prolific sections of e-cig supplies and vaporizers, making us your foremost vape shop in Scottsdale, AZ. When you step into our shop you’re not only going to be greeted by an expansive range of products—you’re also going to be met by a friendly, knowledgeable staff that’s dedicated to assisting you in any way we can. Whether it’s finding a specific product you might be on the hunt for, to giving you a proper introduction to e-cigarettes in Scottsdale, AZ, trust that we’ll take the time and pay you the attention you deserve. We’re here to share our expertise and experience, so when you leave, you’ll always feel confident in your purchases! We’re the largest smoke shop in Arizona! We’re open 7 days a week, for your convenience! We’re pleased to serve the entire Phoenix, Tempe, Scottsdale, Chandler and Mesa areas. All of our employees have a depth of experience when it comes to smoke-related products and counter-culture items! We carry only the top name brands from across the industry, and take pride in knowing about each and every product we sell. See What Our Selection has to Offer! Looking for a unique piece of glass? Want to learn more about vaporizers and ecigs? Need a particular product? Contact us today with all of your questions and concerns! "Great customer service. Curtis helped with decisions by offering suggestions and was willing to look into products if they didn’t carry th..."